Initially named "Clint Fighting", Urban Rivals is a multiplayer trading cards game which was created by Simon Leloutre, then managing director at Acute Games/Boostr. The very first versions of the game were based on iMode and Wap mobile platforms. In 2006, under the management of Sebastien Flory, the game was ported onto the internet, integrating major improvements of its gameplay. Mobile versions were then forsaken until iPhone and Android versions were launched respectively in 2010 and 2011. 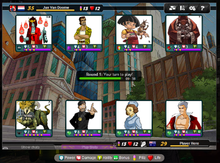 Urban Rivals is an online multi-player card game. Each card represents a character (many of which are based on real people or well-known fictional characters). Each character has specific Power and Damage values, and belongs to a clan. Each clan has a special bonus, which is shared by all the cards in that clan. Most cards also have abilities that aid in battles, some of which counter or are triggered by other cards' abilities. Free registration gives a player 8 character cards; more cards can be purchased later using the in-game currency, 'Clintz', or through random packs using premium currency, Credits. 4 new characters are added every two weeks, and included in the 'New Blood' pack in the shop, which contains the 50 most recent additions to the game. In addition, every year, a new clan is released. During the introduction of the new clan, 4 (previously 6) new characters from that clan are added every release for the first two weeks. The game uses affiliate marketing to encourage existing players to recruit or sponsor new players. An associated webcomic is posted occasionally on the Urban Rivals official website. Sometimes this comic gives out hints of a new character or clan. When a battle starts, 4 cards are randomly dealt from each of the two players' decks, usually made up of 8 cards. The cards in your deck are limited by the format's star count. Each card has a star count, from 2 to 5, with the total star count being either unlimited (called T2) or 25 (called T1). The person with the higher star count between his 4 cards plays first, with the two players alternating between playing first or second each round. Each player, one after the other, chooses one card and plays a number of 'Pillz' (minimum 1), resulting in an Attack Value equal to the cards power value multiplied by the number of Pillz used. The two cards' abilities and bonuses may affect either card's power or attack values, or even cancel their abilities or bonuses. In a random fight, the card with the greater Attack Value has a greater chance of winning the round and dealing its Damage Value to the opponent's Life Points. In a non-random fight, the greatest attack always wins the round and deals its Damage Value to the opponent's Life Points. All competitive fights are set to non-random. If there is a tie, then the card with the lower star count wins. If both cards have the same star count, then the person who played first wins. The battle will end after 4 rounds, with the winner being the player with greater Life Points. The battle may also end once one player loses all of their Life Points. Each player begins a battle with 12 Pillz and 12 Life, except in ELO, where each player begins with 14 Life. Players receive 1 additional Pill before every round. After each battle, players receive battle points (BP). These points are used to upgrade a player's level. More points are earned from having a card defeat an opponent's card with more stars than yours, or one of the characters leveling up after a fight. A bonus is given if a player has Pillz remaining after the battle ends, but a penalty is incurred for causing a battle to time out. Characters receive experience (XP) after each fight, with which they level up (the starting and maximum level is determined by the character, with 1 being the lowest possible, and 5 the highest possible) and become stronger. Characters earn more XP when winning, and when defeating characters with more stars. Many characters also receive an ability to help them in battle when they reach their maximum level, though some receive their ability earlier. A player's level is based on their current number of battle points (BP). When a player reaches Level 5, they can join a Guild. Upon reaching Level 10, they can create their own Guild. Upon reaching Level 15, they can take part of ELO mode. Players also receive a "Leader" card every 5 levels until Level 50. The current flash client for Urban Rivals is as3, which, unlike its predecessor, features ambient music, additional sound effects, and animations displaying the effects of the characters' abilities. Every other hour, there are one-hour tournaments where players have the opportunity to win Clintz or free Credits. There are also more strategy-based ELO tournaments, with stricter deck-building rules, which last a week. In ELO, players start out with 1000 points. A player is matched randomly against an opponent within 150 points of him/her. Players gain more points from defeating higher-ranked opponents, but will also lose more points if they lose to lower-ranked opponents. Players will gradually have their scores reset to 1000 if they do not play ELO mode for a few days. At the end of the week, 12 random players of the Top 100 receive a CR (Collector card). 50 random players above 1200 points receive a random Rare card. Players are also awarded free Credits and share out the Jackpot (Clintz) based on their final ranks or ELO points. On December 8, 2008, the game added a new Event creation feature, allowing any players above level 40 to create his own customized tournaments. Rules can be set with a high degree of flexibility, in terms of scoring, matchmaking and more. The community has created more than 10,000 different Events in 3 months, some are based on story-telling, others on guild vs guild. On December 18, 2009, the mission feature was introduced. Completing missions gives players a new way to receive cards, Clintz, and Credits. There are more than 1,000 missions with more being released with every new release of cards or clan, as well as for a few characters within each clan. These missions also include Legendary Missions, a series of four or five missions related to the clan, which will award the player a Legendary card upon completion (Credits if the player already has such card). Legendary Missions are unlocked every few weeks or so, and last about a month. An annual competition at Urban Rivals is held every year to crown the "Most Beautiful and Talented Woman of Clint City". The rules are very simple: All female characters released in the year are eligible for the contest. Players then begin voting which one, and the contestants are later cut down to 8. Players then begin voting one out of the eight remaining contestants, and they are later cut down to the final 3, where players vote again from these three, and finally the winner is announced sometime later. The winning card is re-released with a beauty paegant-themed artwork and a "Miss" prefix in celebration of her victory (The original card is still available, though). In 2009, Miss Clint City was cancelled by the staff. After overwhelmingly negative responses from the players over the cancellation, the UR Staff brought back Miss Clint City in 2010. Raptors Escaped prisoners and primeval creatures Cancel Opp. Attack Modif. Characters of Urban Rivals are represented in the form of cards. Each character represents a certain clan and has unique background stories, sometimes in relation to another character or clan. Each character also has different Power and Damage stats, accompanied by various abilities to complement their respective clan's bonus. There are currently 1,264 characters available in the game as of December 2015. These characters include 86 Collector cards (tagged Cr). They are discontinued characters that can no longer be purchased from the shop; therefore they must be obtained from trading with other players, winning the daily lottery (discontinued as of August 2011), or winning the weekly ELO draw. On some occasions, the staff announce which characters will be retired from the shop one week in advance via the homepage news. Within 24 hours after the announcement, all existing sales of the upcoming Collector characters in the Market are cancelled, and any new sales of them are blocked. These characters will remain in the card packs for the week before being eventually removed from those packs. In addition, there are a selection of Legendary cards (tagged Ld). They can only be obtained through the completion of series of clan-specific, limited-time missions, and can never be traded nor sold. There are currently 26 Legendary cards. Also included in the entire character roster are Rebirth cards (tagged Rb). Introduced in January 2015, they are old characters that are re-released in the form of cards with new artwork, although the stats and abilities of their original cards remain unchanged. Urban Rivals received 88% from Game Vortex, praising the typical five-minute game length, free access and poker-like element of the gameplay. However, the presentation was seen as functional, with inconsistent artwork quality and lack of sound.